Beautify Beaumont, Inc. Projects - Beautify Beaumont, Inc.
We have received numerous requests for a listing of the Earth Kind roses planted on the Maree Calcote Greenway and Extension. Below you will find a listing. The roses are listed going from East to West along Phelan Blvd. The Peggy Martin Rose on the trellis. The roses then repeat in mirror image of the list above. 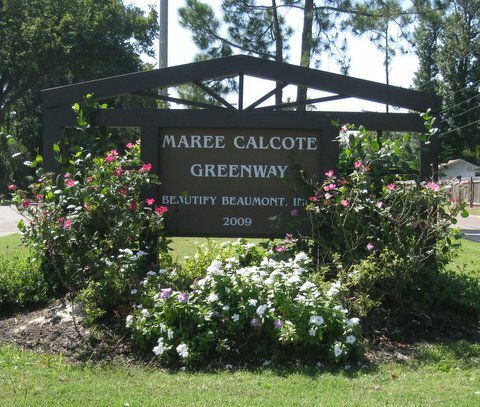 The Maree Calcote Greenway is a planting of “Earth-Kind” (drought tolerant) roses located at the intersection of Kennedy and Phelan Boulevard honoring Maree Calcote; long-time community volunteer and advocate for a more beautiful and conservation minded Beaumont. This is a project of Beautify Beaumont, Inc. in conjunction with the City of Beaumont and the Jefferson County Agricultural Extension Agency.